Dun Hallin, detail of cell. 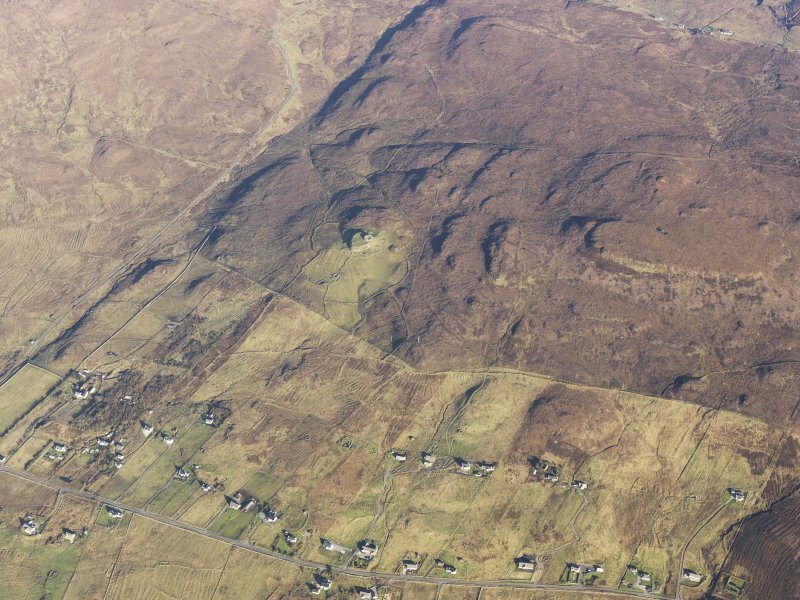 Oblique aerial view of the remains of the Dun Hallin broch and the township of Dunhallin, with the remains of the adjacent field system, enclosuires and lazy beds, Waternish, Skye, taken from the SW.
Dun Hallin, batter of wall. Plane-table survey of Dun Hallin. 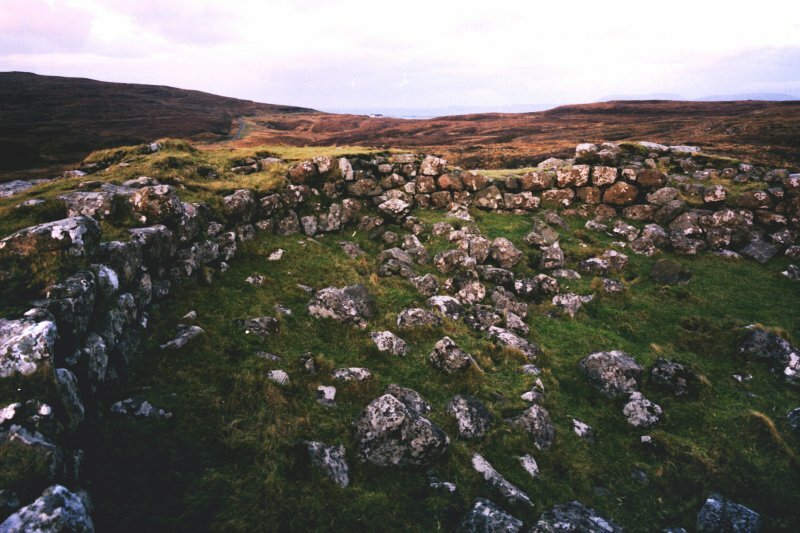 View of the interior of the Dun Hallin broch. 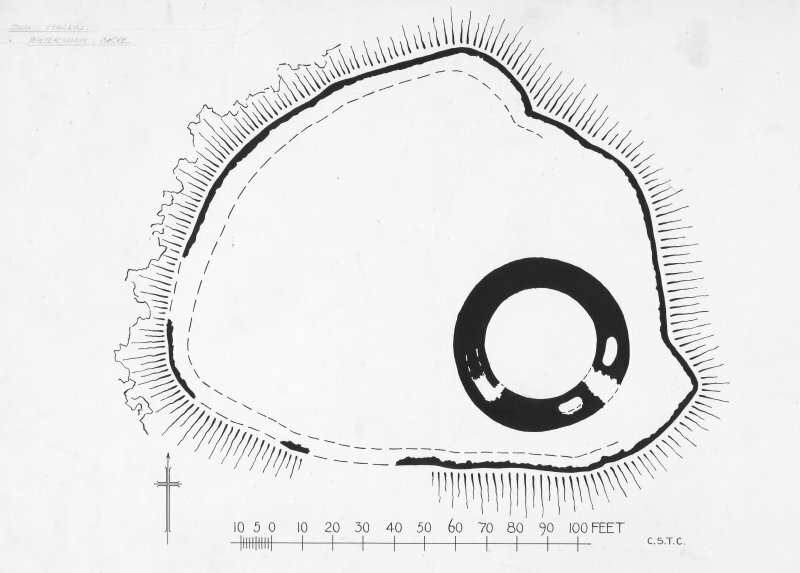 Publication drawing; plan of Dun Hallin. Dun Hallin, a broch, occupies the SE end of a rocky plateau around the edge of which are traces of a wall. The broch has an internal diameter of 36' with walling from 9ft 9ins to 11ft wide and up to 12ft 6ins high on the N and W. The entrance on the SE is ruined but on either side an oval cell is visible. A gallery can be traced on the SW.
RCAHMS 1928; A Graham 1949. Dun Hallin, a broch as described above. Visited by OS (ASP) 3 May 1961. Dun Hallin occupies the SE corner of a roughly triangular flat-topped rocky outcrop overlooking Hallin and some 800m from the cross-roads to Geary; apart from the natural protection afforded by the rock stack the broch is additionally defended by a wall that runs round the perimeter of the stack enclosing an area about 40m from N to S and 50m transversely. No inner facing-stones of this outer work are visible, for the interior appears to have been cultivated, but, on the NW flank, stretches of the outer face still survive below the summit of the rock and this suggests that the wall was originally about 3.3m in thickness. The broch has been constructed of large blocks of stone, the outer wall rising with a distinct batter to a height of 3.4m. 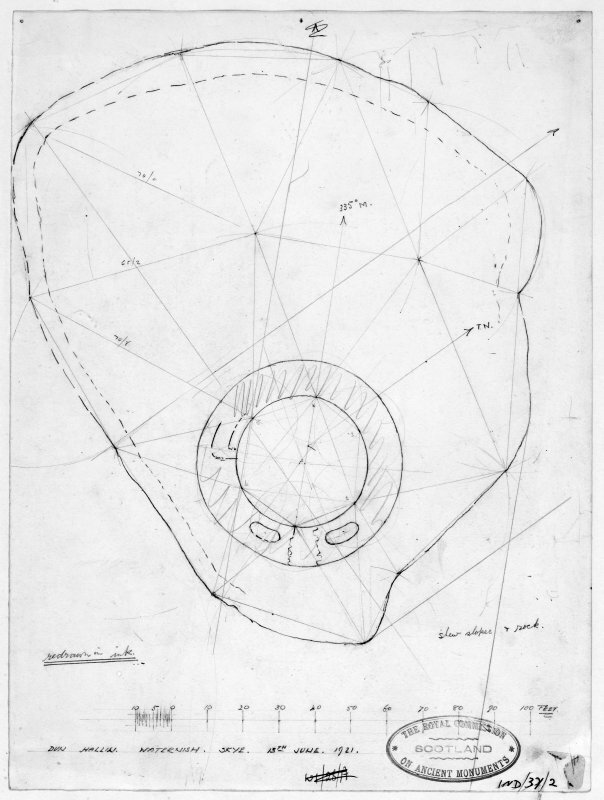 Circular on plan the broch measures about 10.8m internally with the entrance passage on the SE being too choked with debris to permit further description. Within the thickness of the wall on either side of the entrance there is a small oval cell. The NE cell is more fully exposed than that on the SW and measures 3m in length by 1.4m in breadth with its walls still standing to a height of 1.75m. Further dilapidation of the SW cell appears to have taken place since the site was recorded by the Commission in 1921, but the corbel stones of the W end of the cell are still visible, confirming a length of about 2.7m; the cell appears to be about 1.2m broad. In neither case can the entrance to the cell be detected. Within the thickness of the broch wall on the SW quadrant part of an intra-mural gallery can be seen; the entrance from the inner court measuring about 1m in width and the first part of the gallery being about 1.2m broad, the visible portion of the gallery terminating in what may be a flight of steps. Visited by RCAHMS (JNGR) 4 November 1990. Dun Hallin, on a plateau of rock to the east of Hallin, looks over the lochs on both sides of Waternish. The circular plan is clear, and the position of the entrance and in places parts of the gallery walls are visible. There are traces of walling around the edge of the plateau on which the broch stands. Two more brochs further north on the Waternish peninsula are worth visiting. Returning to Hallin, continue along the road to Trumpan, where in the graveyard there is an interesting carved slab representing a priest. At the bend in the road to the east of the old church, walk north along the track for about 2km to Dun Borrafiach (NG 235637), which overlooks a broad valley. The interior is full of fallen stones, but the exterior is remarkable for the size of some of the stones used and the quality of the building. The position of the entrance and some of the gallery wall-faces can be distinguished. 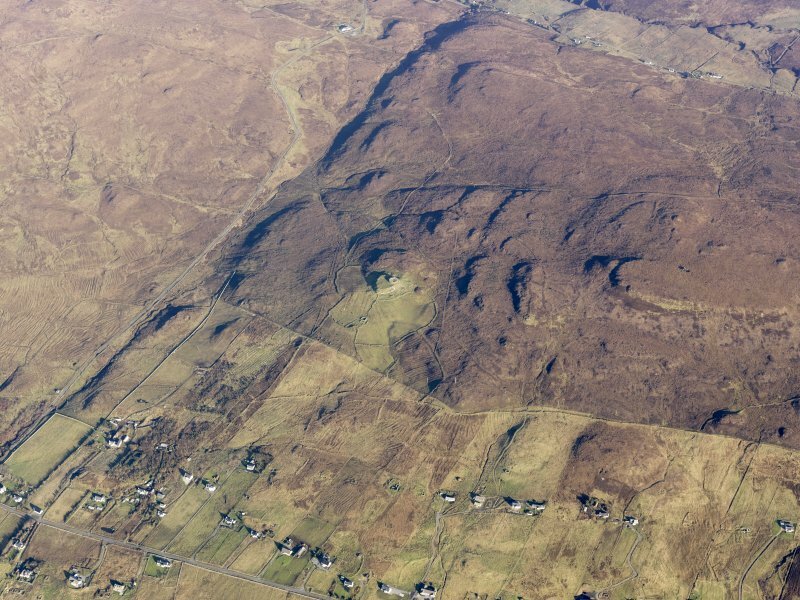 About 1km further north, again on the right of the track and up a slight rise, is Dun Gearymore (NG 236649) which is very ruinous, though most of the inner and outer wall-faces are visible, as are the walls of galleries, but not the entrance. In the north-west sector a few missing lintels give access to a gallery which is now mostly below ground level; it is low and narrow but can be traced for over 6km round the base of the broch. This unexcavated broch in Duirinish, Skye, stands about 137m (450 ft) above the sea and on .the south-east end of a flat-topped, steep-sided rock knoll overlooking a fertile valley and the sea (visited 24/4/63 and 15/8/85). 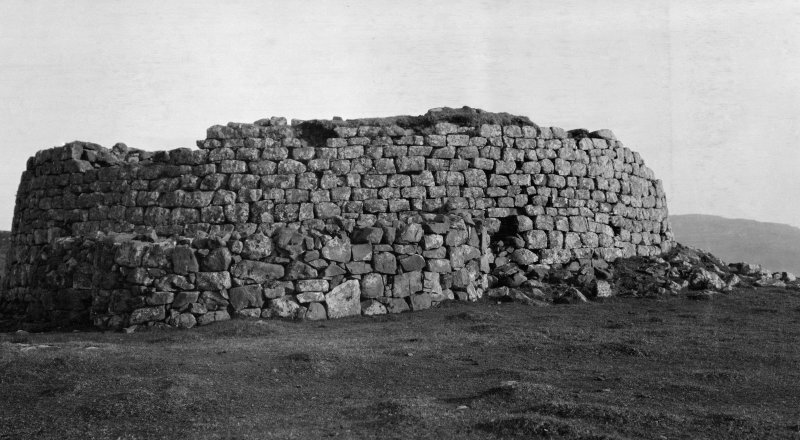 The broch wall is well preserved, up to 3.81m (12.5 ft) high on the north and west, and the outer face has a marked batter; both faces are built of cubical stone blocks and the interior is full of debris. The entrance is on the south-east but is either too dilapidated or too concealed under rubble for measuring; there seems to be one lintel near the inner end, which – if in situ – might suggest that it could be intact here and standing up to 1.8m high under the rubble. On each side of the passage is an oval mural cell neither of the doors of which are visible; they seem likely to be a pair of guard cells [3, plan]. The northern, right hand cell measures 2.85m (9.5 ft) long by 1.35m (4.5 ft) wide and has been cleared out to a depth of over 1m at the end furthest from the passage. The lintel of what seems to be a doorway to the interior has been seen . The south cell was measured as 2.1m (9 ft) long in 1921 but is not easily seen now. 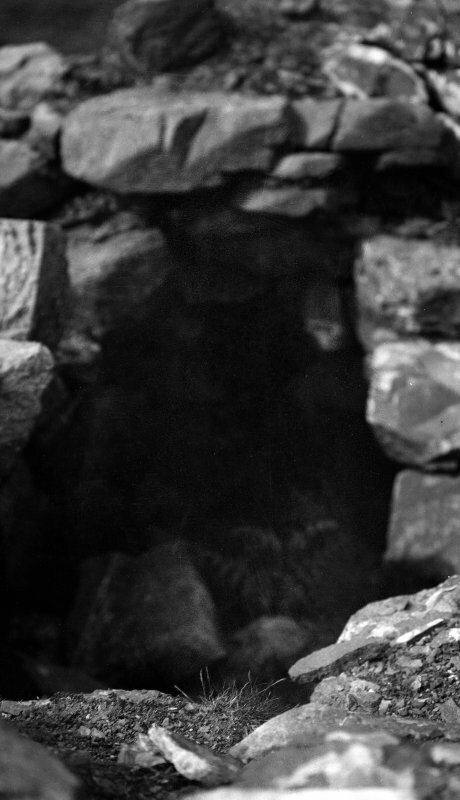 The interior of the broch is full of rubble, much of it grassed over; the inner wallface now stands one or two courses above the rubble, less than the 1.2m (4 ft) mentioned in 1921 . A mural gallery is visible on the south-west arc and the Commission's plan shows a door leading to it, though the text does not mention it. In fact at least one lintel remains in position over this door, at the level of the surrounding rubble, and a scarcement of the ledge-type can be seen at its inner end, mostly grassed over. Moreover, though the sides of the gallery leading clockwise from this door seen in 1921  are not now apparent, the outer ends of six steps of the intra-mural stairway were found just exposed; the outer half of the wall has fallen away from them. 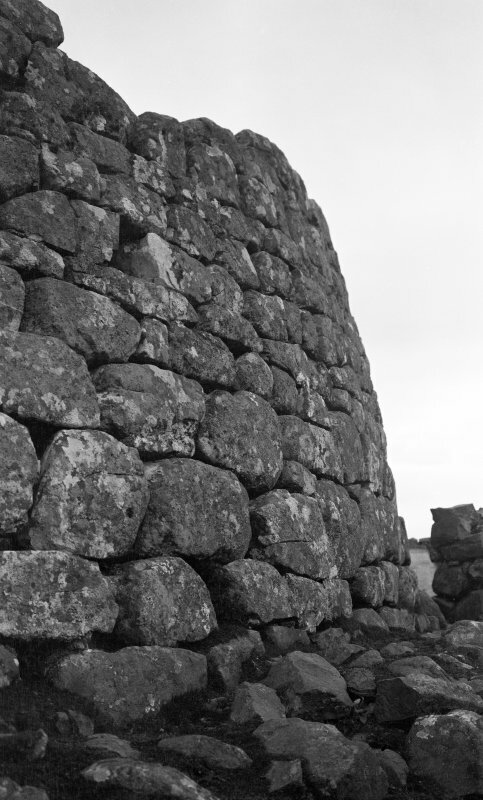 The highest steps are 3-3.6m (10-12 ft) above the external turf, and are rising above the scarcement; there is therefore litt1e doubt that the upper intra-mural gallery is partly preserved under the rubble and that the structure is a hollow-walled broch. This seems to be confirmed by traces of an upper intra-mural gallery seen at about 4 o'clock [3, plan]. 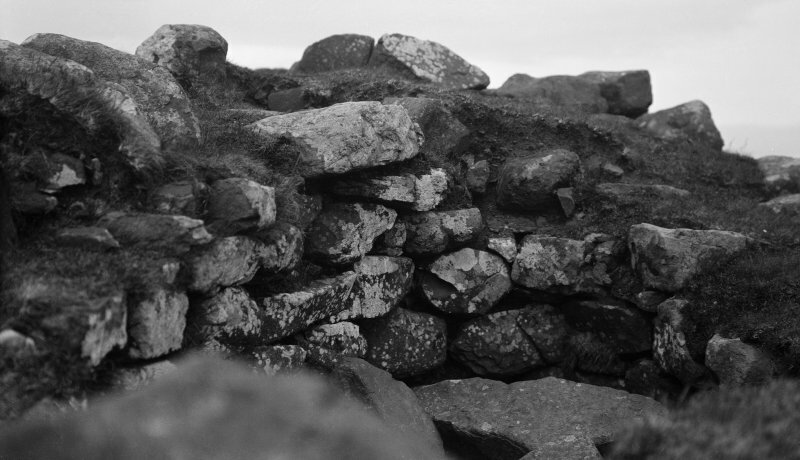 An outer stone wall runs round the edge of the knoll, which is about 6.1m (20 ft) high at the south; it is up to 25.9m (85 ft) from the broch on the north-west but only 2.44m (8 ft) on the south-east. The enclosed ground is a flat, grassy area. The internal diameter is given as 36 ft (10.98m)  but this is above the scarcement; the actual measurement across the central court is likely to be about 10.52m (34.5 ft) ; similarly in 1921 the wall was measured as from 9 ft 9 in to 11 ft) (2.95-3.36m) but these measurements must also have been taken above the scarcement. It is also not clear whether the batter of the outer face was allowed for. The external diameter should be about 17.39m (57 ft) and the wall proportion perhaps about 39.5%. Sources: 1. NMRS site no. NG 25 NE 1.01: 2. RCAHMS 1928, 158-89, no. 509 and figs. 206 and 226: 3. Swanson (ms) 1985, 851-52 with plan: 4. MacSween 1984-85, 42-3, no. 11 and fig. 11. 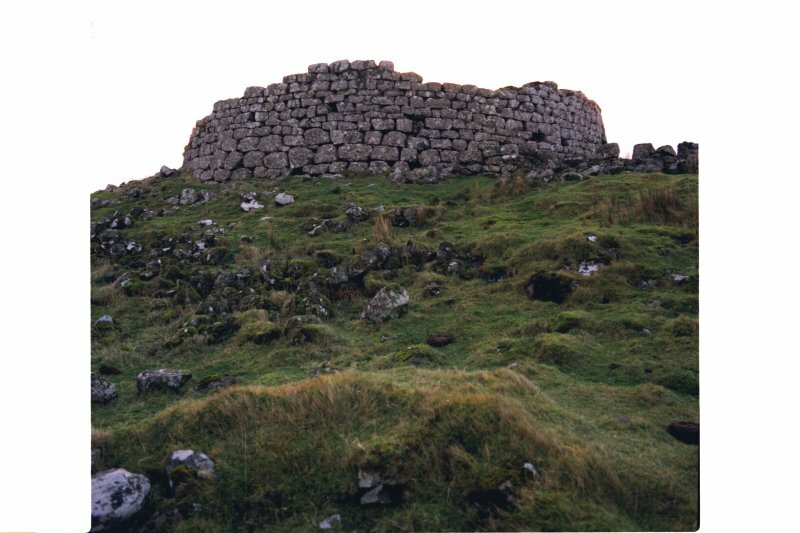 The well-preserved broch known as Dun Hallin, with its externally battered wall still standing 3.4m high, occupies the SE angle of a larger enclosure on the level summit of a rocky hillock. Roughly triangular in plan, this enclosure measures about 50m from E to W by a maximum of 40m transversely (0.15ha) within a wall that extended all round the margin of the summit. No inner facing-stones are visible, but runs of the outer face survive on the NW flank of the hillock, where the wall was probably about 3.3m in thickness. The position of the entrance is not known, though that of the broch faces SE. 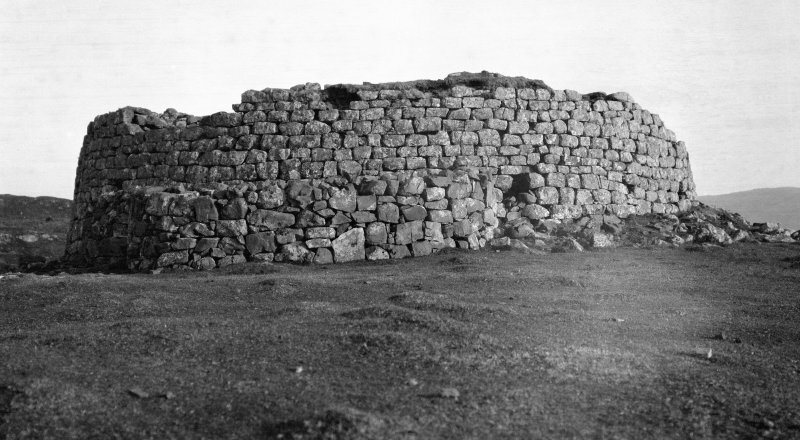 The interior to the N and W of the broch has been cultivated in low rigs.